Hi Everyone! This year (2015) the Marine Corps turned 240 years old! And to celebrate, my awesome Marine hubby asked me to make him and our Senior Pastor (also a Marine) a cake! So as I was putting this one together I took plenty of photos to share with you guys. Check it out! Note #2: Because modeling chocolate is used on this cake, be sure to refrigerate cake as often as needed. Also, keep your work environment cool to prevent modeling chocolate from softening or drooping. If you do not have experience with modeling chocolate, be sure to practice with it a bit to get a good understanding of how to work with it before making your cake. For this tutorial, I will be making an actual life size Marine cover (hat). 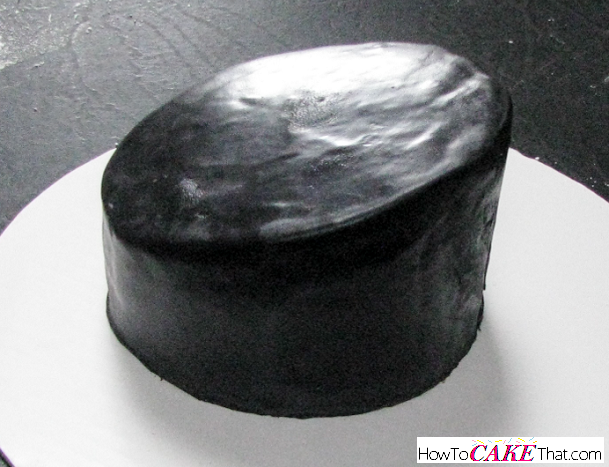 To begin, bake a 6" round cake that sits about 4 1/2 inches tall. 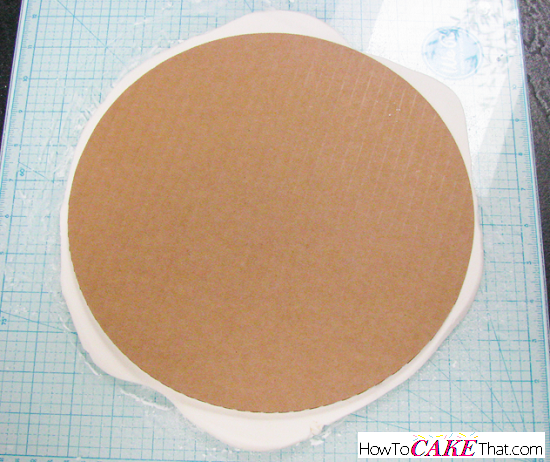 Place the cake on a cardboard round and trim cardboard so that it is slightly smaller than the cake. Fill, stack and frost the cake. Be sure to spread a thin layer of frosting around the outside of the cake as well (not seen in photo). 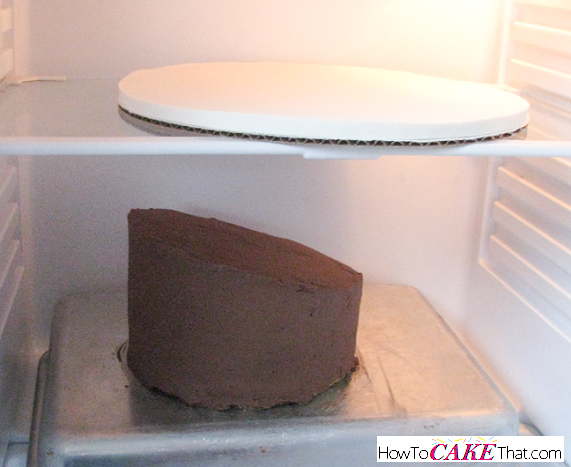 Place cake in the freezer for at least an hour - this will help keep the cake sturdy when it is time to carve it. Next, we will be making the top round part of the cover. Now this part will need to defy gravity, so we need a good sturdy ingredient. I am using my Candy Melt Modeling Chocolate recipe. On a surface dusted with cornstarch, roll out the modeling chocolate until it is about 5/16 of an inch thick (a tiny bit thicker than this is fine, but be sure not to go any thinner). The top part of my husband's Marine Corps cover is about 10" in diameter, so I placed a 10" round cake cardboard on the modeling chocolate to use as a guide. NOTE: If you are able, I recommend making the top part of the cover, cutting it out and refrigerating it the day before you assemble the cake. That way it will have a chance to harden a bit more. I didn't have time, so I made the cover the same day as I decorated the cake. Using the 10" round cardboard as a guide, trim away the excess modeling chocolate with an Xacto knife. After the top of the cover has been cut out, turn the modeling chocolate and cardboard right side up and place in the refrigerator. Leave the cornstarch side of the modeling chocolate facing up. Do not try to flip the chocolate over to the good clean side yet - this will be done after it has chilled and hardened. 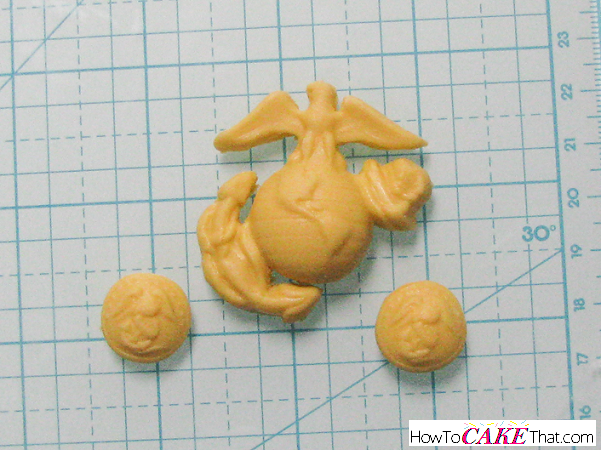 If you have access to the cover's Eagle, Globe and Anchor (EGA) and buttons that go on the side of the cover, create a mold of them - it makes life a lot easier and also gives your cake a more realistic appearance. 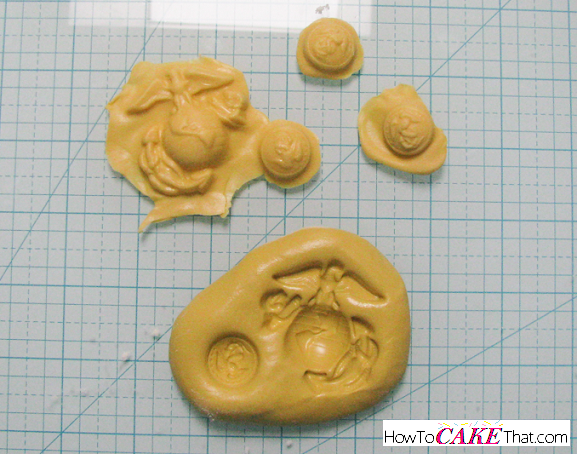 The molding material I used is the food-safe Amazing Mold Putty. Using fondant with a little Tylose powder (for drying) mixed in, color with a little Wilton's gel color in Buttercup Yellow to give it a gold color. Press fondant into the mold and remove. Set aside to dry. NOTE: if you have time to do this the day before, I highly recommend it. The drier they are, the easier they are to work with. If you don't have time, and need them to dry fast, place them in your oven with just the oven light on. The light will generate heat and will cause them to dry faster. 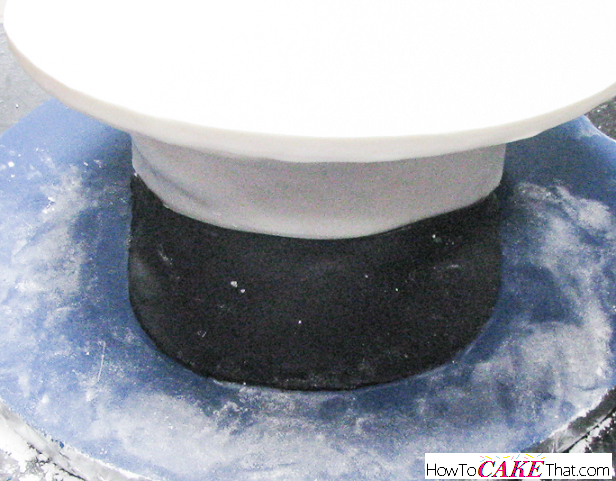 Use this method on the fondant covered cake base (below), if needed. Next, it's time to cover the cake base. 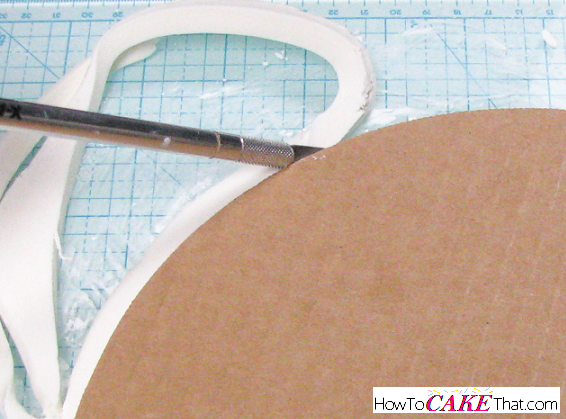 I'm using a 12" cardboard cake drum. I wanted my cake base to look like the USMC dress blues pants with the red blood stripe. To achieve this look, color fondant with either Americolor gel color in Navy, or Wilton's Royal Blue with a touch of Black (to create Navy). 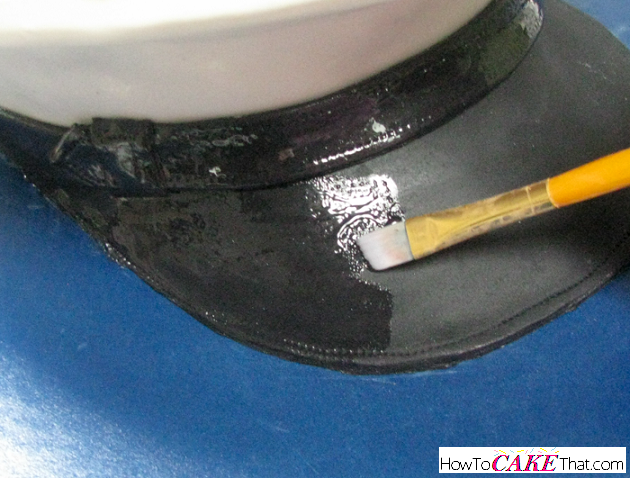 Either spray cake drum with a little water or brush with piping gel to make the fondant stick. 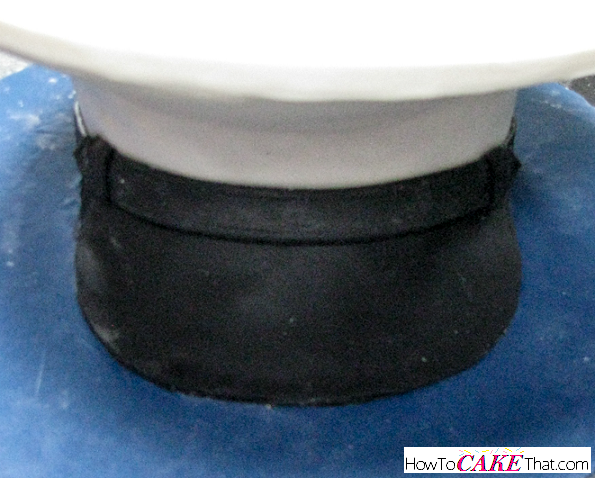 Roll out fondant and cover cake drum base and trim. Set aside to dry. After your cake has become nice and stiff from being in the freezer, remove it from the freezer and place it on your work space. Now we will be making our marks on our cake so we can see how steep of an angle we need to trim the cake. For my cake, I made a mark on the backside of the cake at 1 1/2 inches high. Then on the opposite side of the cake (the front), I made a mark at 4 1/2 inches high. 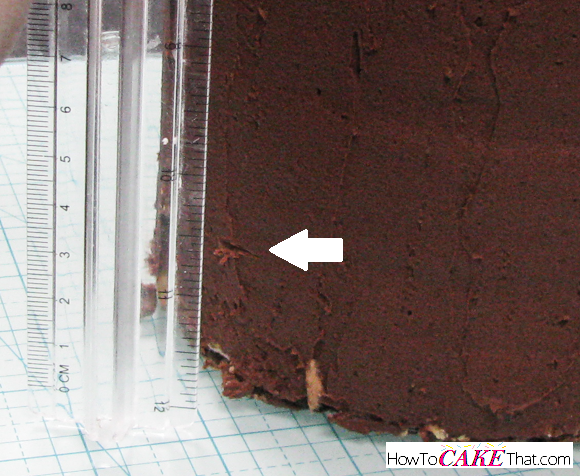 Using a knife, score a mark in the frosting from one mark to the other to create a guide for trimming the cake. 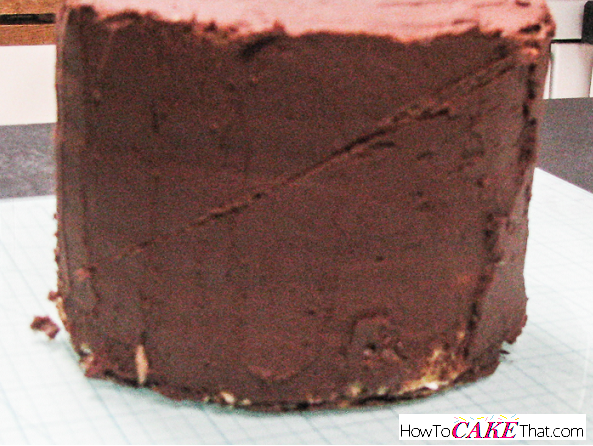 Using a large sharp knife, trim the top of the cake, following the guide marks. Give the cake a nice smooth coating of frosting. Place the cake in the refrigerator to chill. If your USMC cover top is stiff, feel free to flip it over so that it is clean-side-up. Keep refrigerating! Once the frosting on your cake has chilled and set (after about 30 minutes or more), remove the cake from the refrigerator and cover with a thin layer of black fondant. 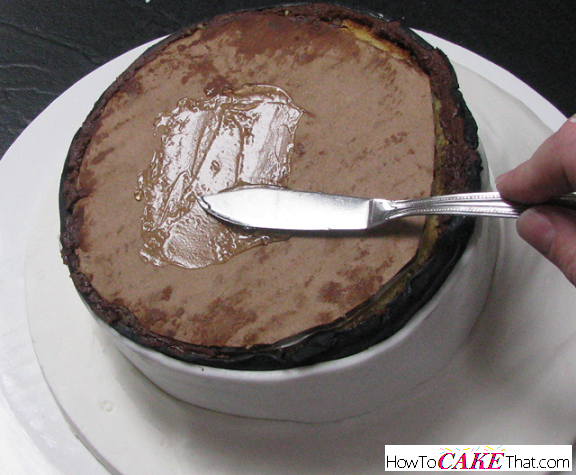 Remove chilled cover top and place on the cake. My fondant covered cake had a bit of condensation on it from removing it from the refrigerator, so the cover top stuck to the fondant with ease. 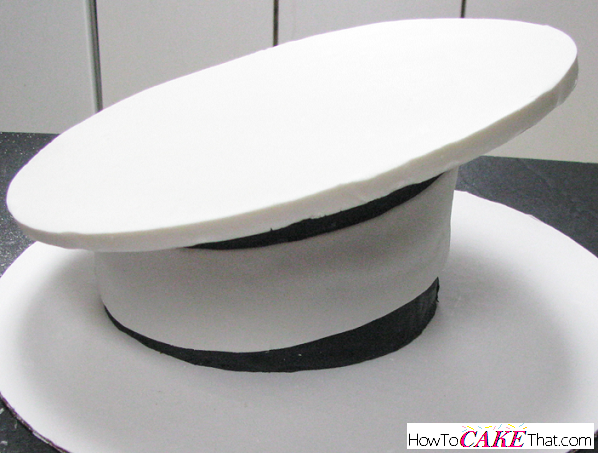 If your cover top is not sticking, lightly brush the top of your fondant cake with a little water. 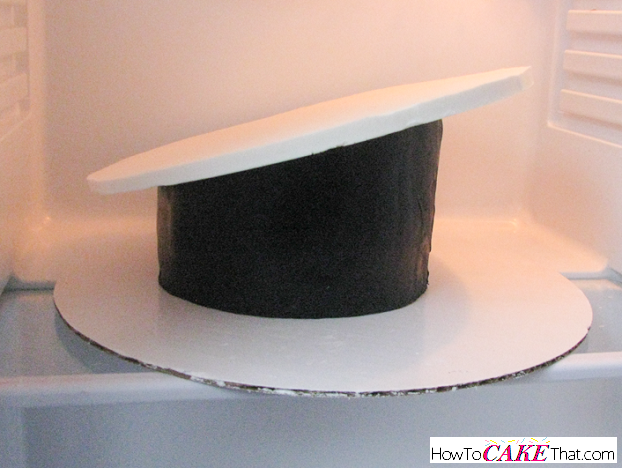 Return cake to the refrigerator to keep cover top from becoming soft. This next part is a little difficult to describe, so I'm using my hubby's cover to show you. The next piece we will be making is the thick white band going all the way around the center of the cover. Notice that there is a thin black band going around underneath of it - our black fondant will be showing underneath the white band... just like what is seen on this cover. 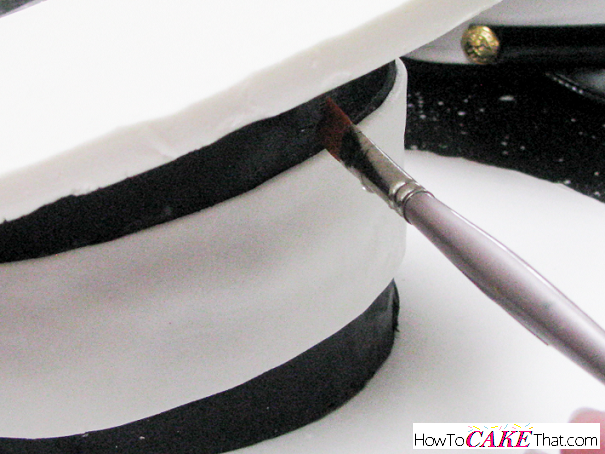 To create this white band, roll out a strip of white fondant long enough to go around the 6" cake. Using a ribbon cutter, trim the white band so that it is 2" wide. Beginning at the back of your cover, wrap the band around the cake. 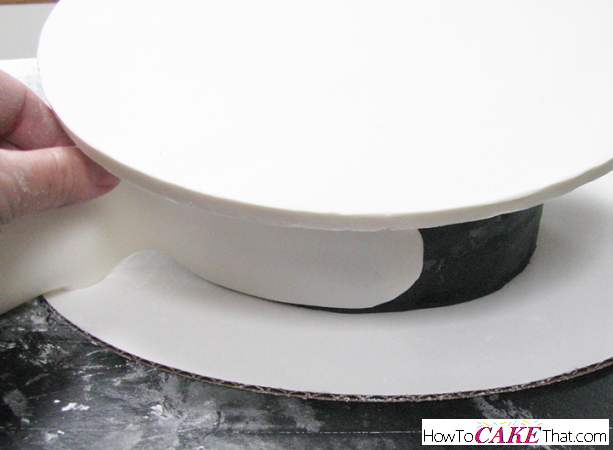 Brush a little water on the underside of the fondant strip to help stick it to the cake, if needed. Be sure to make the fondant strip swoop upward toward the front of the cover. 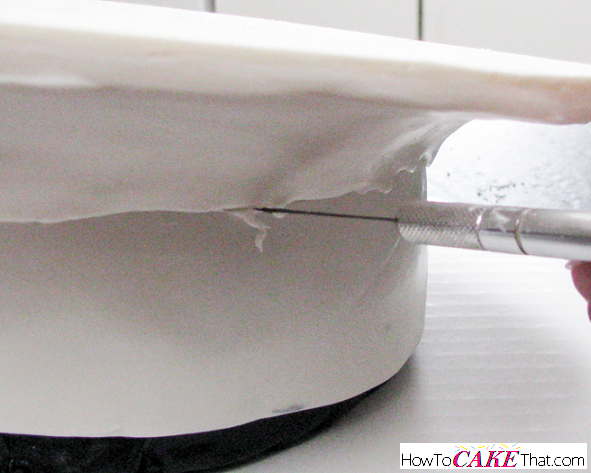 Use an Xacto knife to trim where the ends of the fondant strip meet. Brush fondant ends with a little water and gently press them together to make them stick. Now we're getting to the tough part of this cake. It's time to build up underneath the cover top. I will be using a blend of 50% white candy melt modeling chocolate and 50% white fondant. The candy melts mixed in with the fondant will give you the ability to buff out any seams or lines with a gentle rub of your finger. Also, it gives us a lot of time to work with the fondant without the fondant drying and getting "elephant skin". 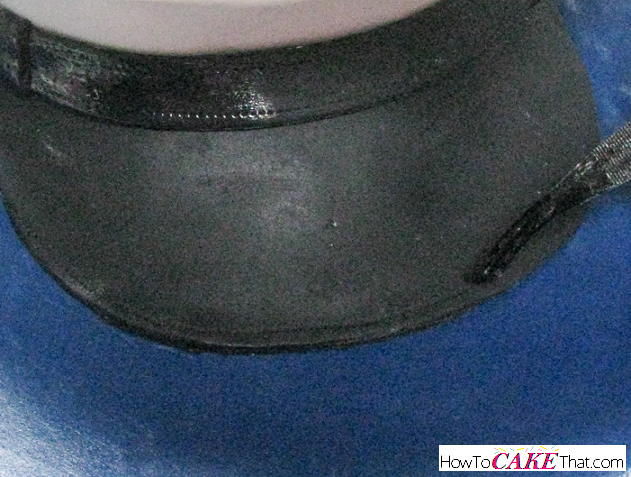 To stick the modeling chocolate/fondant mixture to your cake, brush the top exposed black fondant with a tiny bit of water, and also the underside of the cover top. 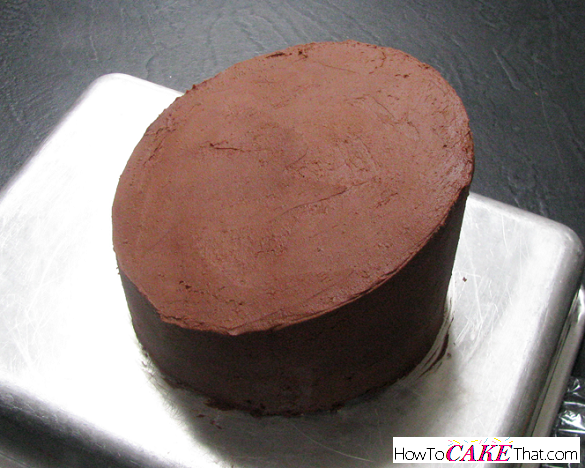 Before placing the fondant and modeling chocolate mixture on the cake, place a cardboard round on top of the cover's top. 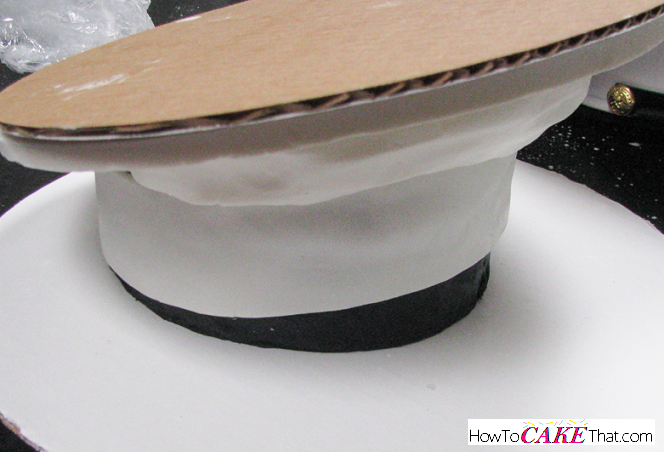 Place your hand on the cardboard round and hold it steady - this will keep the cover's top from breaking or becoming misshapen when applying and shaping the fondant/modeling chocolate mixture underneath. To apply the fondant/modeling chocolate mixture, roll into a large thick sausage shape and thin out the ends a bit. Press the fondant/mod. chocolate sausage to the underside of the cover. Use your fingers to distribute and shape the modeling chocolate. Here is the scary part, place your hand on top of the cardboard round. Place your other hand under whatever your cake is sitting on, and flip your cake upside down. 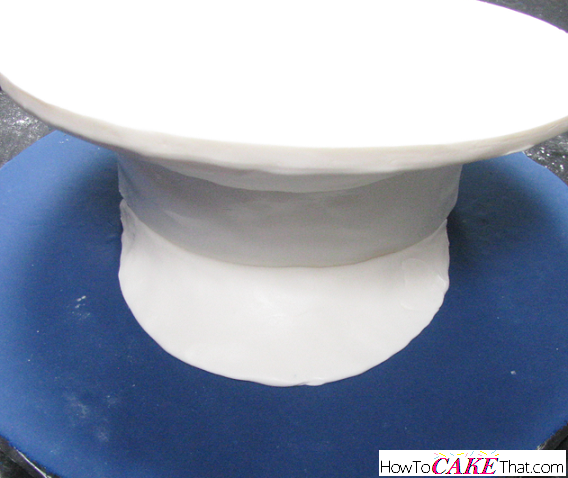 Using a fondant smoother, smooth out the underside of the cover. Use your finger to buff away any unwanted seams or lines. Flip your cake right side up to inspect and see if you're happy with the underside of your cover's top. If so, use an Xacto knife to trim and even where the middle band meets the underside of the cover. 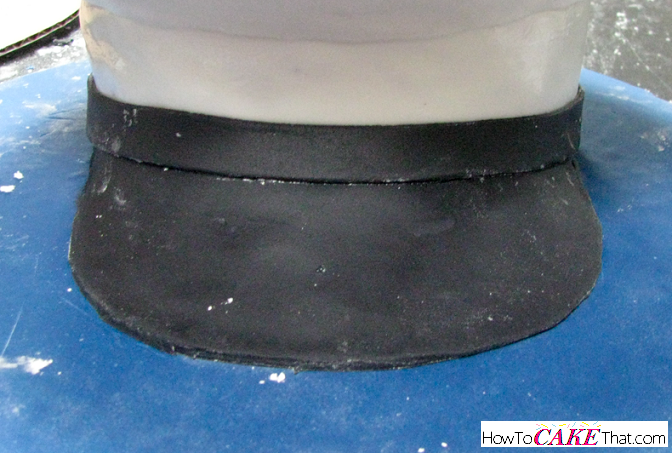 Be careful to not trim away too much - we don't want to expose the black fondant underneath. And one last time, flip your cake over. It is now time to attach it to the fondant covered cake base. 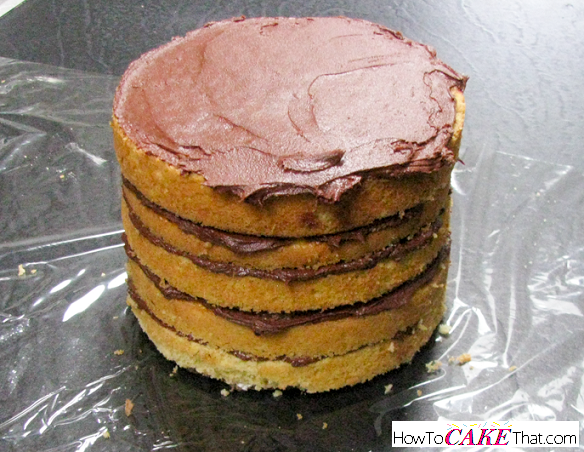 Using either piping gel, frosting, or melted chocolate, smear a bit to the cardboard round under your cake. 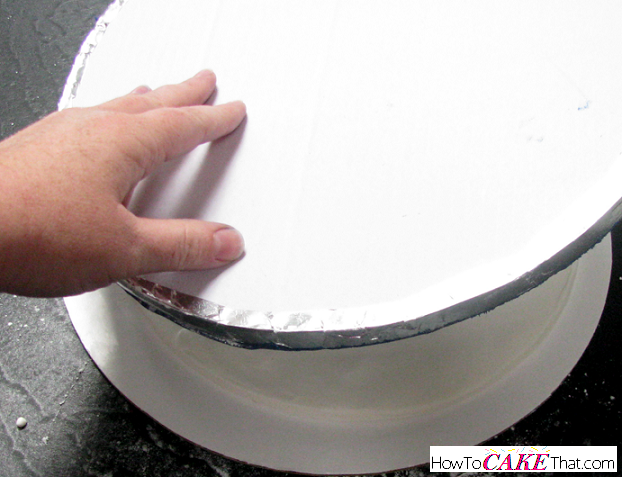 Line up and set your cake base on the underside of your cake. 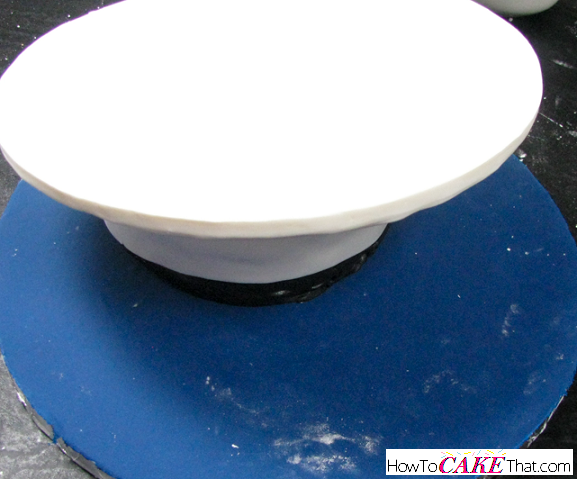 With one hand on the cake base and the other on the cardboard round, quickly flip your cake back to right side up. Now it's time to build the bill of the USMC cover. 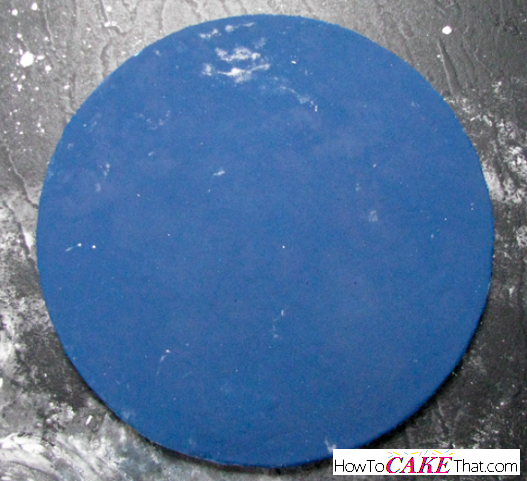 Using the fondant/modeling chocolate blend, shape the bill of the cover. NOTE: If I were to make this cake again, I would have cut the cardboard underneath the cake so that I could have built the bill before securing the cover to the cake base. That way I wouldn't have to worry about being careful not to cut marks into my fondant covered cake base. 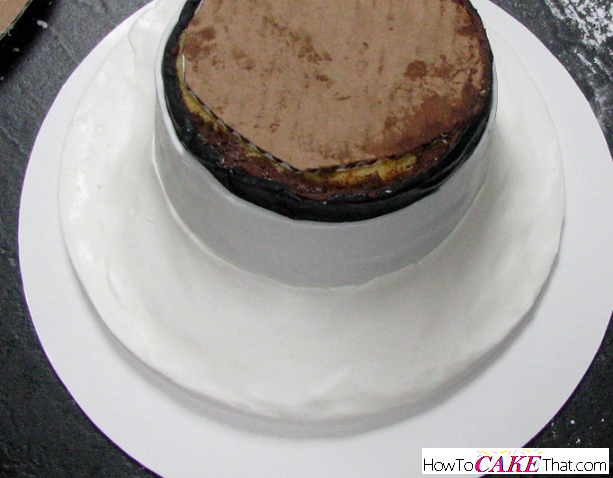 Next, roll out a thin sheet of black fondant and carefully trim it to size to create the bill. 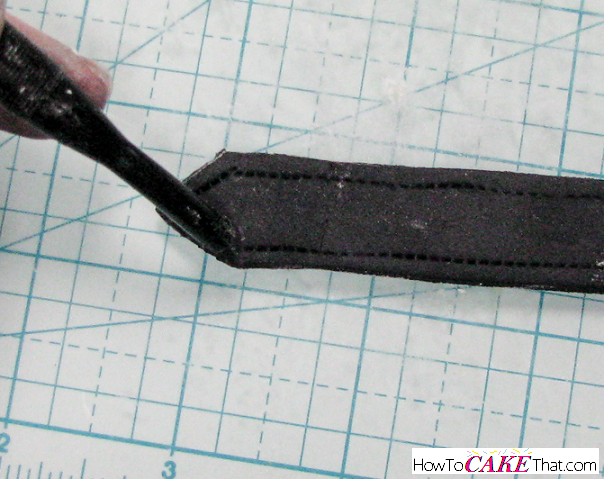 Next, cut out a strip of black fondant to use as the band that sits over the brim. My band is about 11/16 of an inch wide. Adhere it to the cover by brushing the back of the strip with a tiny bit of water. Cut out one more strip in the same width to use as the second shorter layer of the band. This band should be about 8 inches in length. Be sure to cut points on the ends of the band and add detail using a stitching tool or stitches could be dotted in using a toothpick. 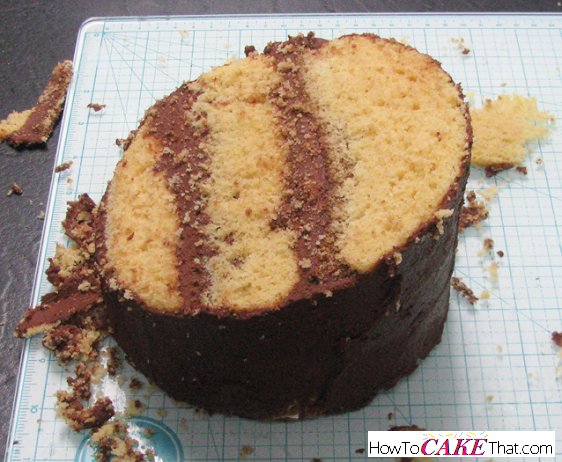 Adhere the outer band to the cake by brushing the back of it with a tiny bit of water. Also add two loop pieces on both ends to represent the loops holding the outer band in place. Be sure to give the loop pieces vertical stitching detail. 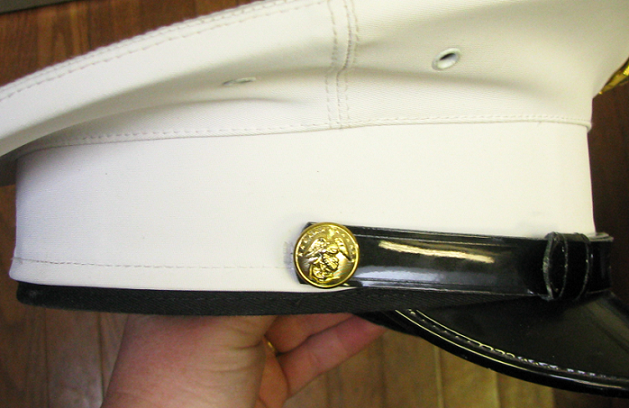 Do not forget to add stitching detail to the brim of the cover and to the upper white part of the cover. 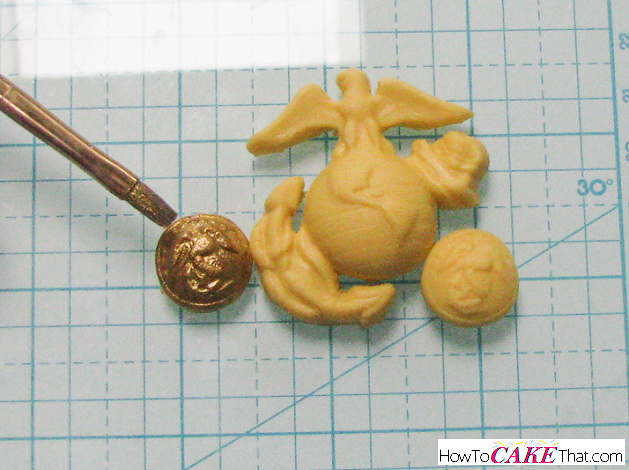 After EGA and buttons have dried enough to handle, use an Xacto knife to trim away the excess fondant. Paint the pieces gold using gold luster dust mixed with a little alcohol (150 proof or higher) to create a paint. I'm using a blend of two parts CK Products in Spanish Gold to one part CK Products in Antique Gold. Allow to dry. Now it's time to clean up the fondant cake board. Use a large soft brush to dust away as much cornstarch as possible. Next, I just buffed the fondant with a little shortening on my fingers and wiped the excess away with a paper towel. And to get into tough-to-reach spots, just brush a little shortening in those areas with a paintbrush. Next, to give the cover a realistic shine, I brushed it with a little corn syrup. If using corn syrup, be very careful not to touch it, and do not paint it until just before delivery to keep it from getting messed up. If you are worried about using corn syrup, buffing the black bands and brim with a little shortening will give it a nice satin shine! OR try brushing on just a thin coat of vegetable oil! It gives a fantastic shine! And lastly, attach the buttons and EGA to the cake by melting down a little chocolate (I'm using white Wilton candy melts) and smearing a tiny bit onto the backs of the decorations and attach them by holding them in place until the chocolate sets (a few seconds). Touch up any missed edges with gold dust and alcohol paint (as you can see, I missed a few spots!). And of course, trim the cake board with red ribbon. 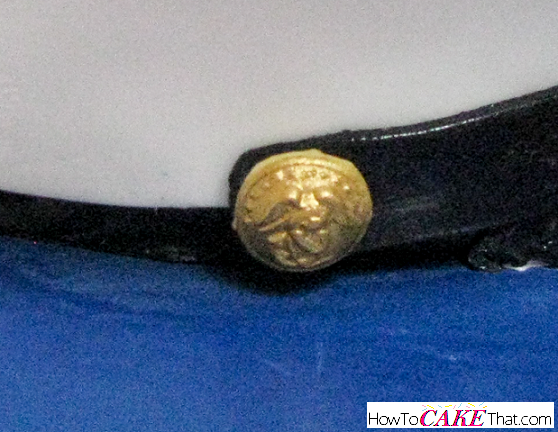 Use a few pieces of double sided tape to hold the ribbon in place around the sides and secure with quilting pins pressed into the cake drum in the back. 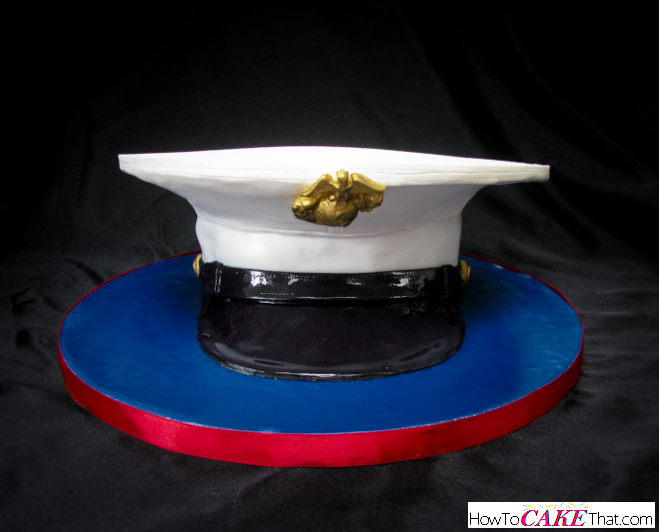 And that's how you make this realistic United States Marine Corps cover cake! If you have any questions, please feel free to comment below or contact me through the "contact" page on this blog. I hope you have enjoyed this tutorial! God bless! !